October 14, 2013 By Allyson 7 Comments This post may contain affiliate links. Read my disclosure policy. I know we are well into fall now, and I probably should have posted this last month, but I just got around to taking pictures and thought it would still be nice to share! Fall isn’t over yet, so I think it’s still applicable! 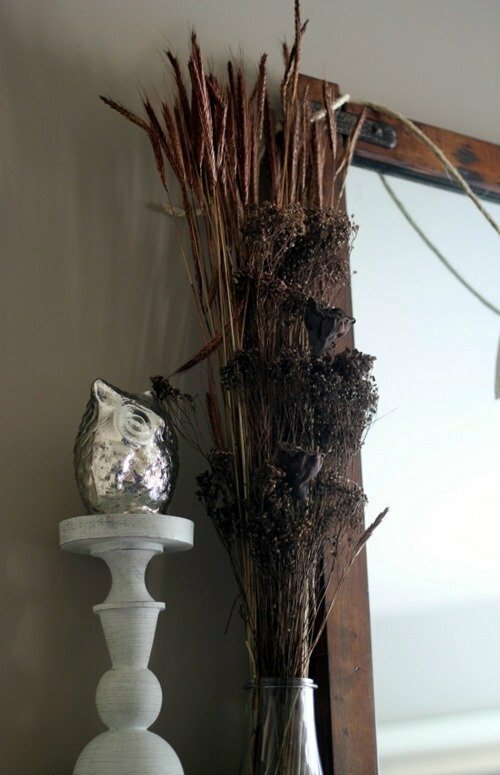 When I was throwing my fall mantle together, I really didn’t want to spend a lot, and wanted to make use of things that I already had as well. 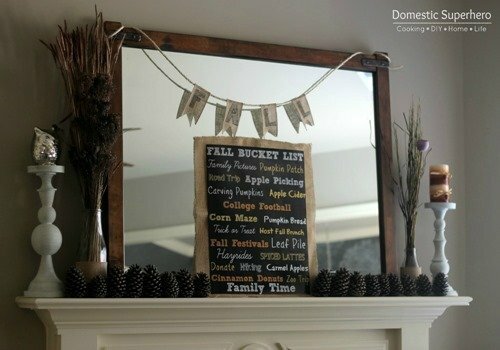 Every year I make a Fall Bucket List, and I thought it would be cool to display it this year. 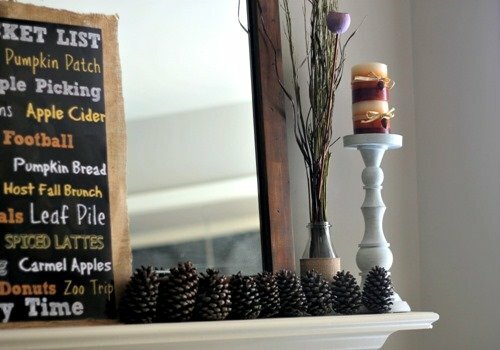 I shared my Fall Bucket List (and a free printable) a few weeks ago on the blog, and I decided to make an easy burlap ‘frame’ to go behind the bucket list. I already had the burlap so that was no expense, and I paid around $2.50 for the print from Costco. Then I made a quick garland/banner with some left over burlap ribbon and twine (all already had on hand). Next, I lined up some pine cones on the front of the mantle. I had these from Christmas last year, so again, no expense. Don’t have pine cones on hand? Go to a local park and collect a basket of them! Just make sure you clean them first, or you will end up with bugs all over your house! I used the same glass containers from my previous mantle to hold some festive branches. I didn’t have the branches though, so I picked those up from Hobby Lobby. They were $4, but I had a 40% off coupon (you can always use the coupon on their website when you are in the store, just pull it up on your phone!) so those were only $2.40! Total score! I also used a little owl I had to brighten things up and break up all the brown on the mantle. I had this little guy from last year (and scored him on clearance at Kohls for only $2!). On the right side of the mantle I used the same glass jar, again, and just put some other floral/branches into it. I don’t even know where these came from and have had them holed up in a closet for at least 2 years. At least I’m finally using them! Then I stacked 2 little candles on the pillar (I am still not sure about this, but it works for now), which I had purchased at the end of the season last year, for $.50 each. Also, the 2 pillars I had from last year as well, also purchased on clearance at some point from Kohls. Have you put together your fall mantle? Will you use stuff around the house as well, or do you usually purchase new things every year? 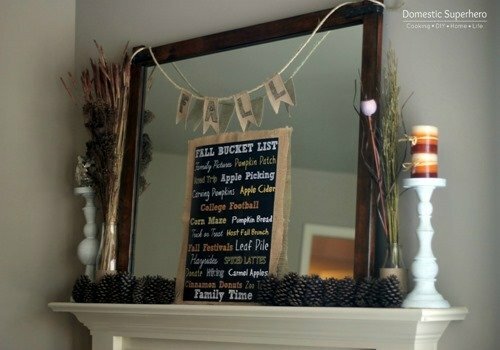 Sweet mantel decor – I l-o-v-e cheap. Love how your mantle turned out, looks super pretty! One of the best pieces of decorating advice I’ve received was “shop your home first!” You’ve done this beautifully and added the rest to finish your great mantel display!! 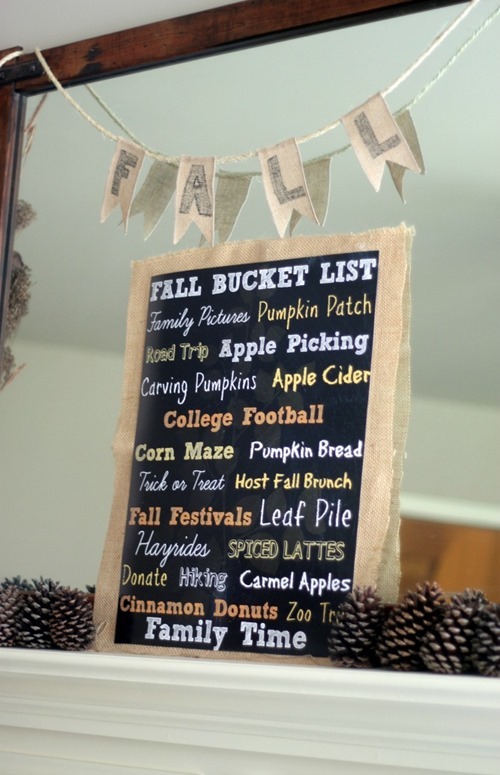 I also LOVE the FALL BUCKET list!! I’m going to download that to use, too. Thanks!! A stunning mantle for less than $6?! Yes, please! I love how it turned out, Allyson! Great job! Thanks so much Abby! It was about time I finished it! Love the price!! Amazing 🙂 It came out great!! 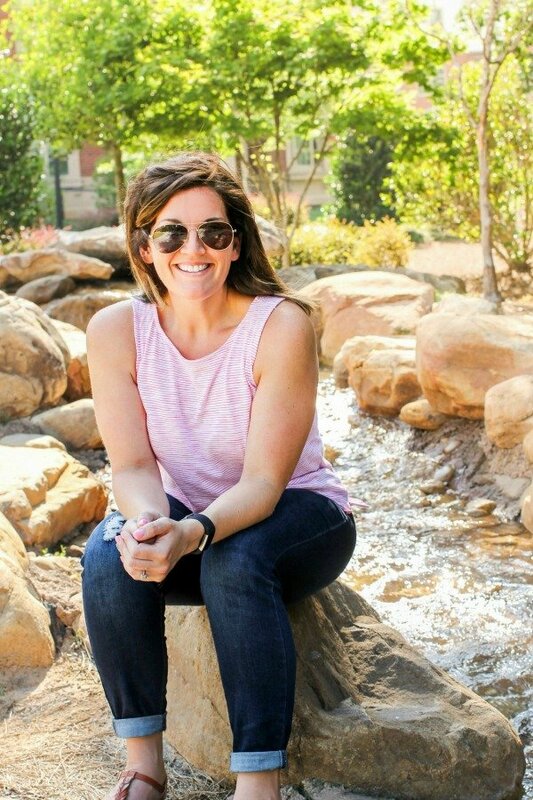 Thank you so much for linking up to Get Your DIY On this past week. I hope you’ll join us tomorrow with any furniture makeovers! !